Heraklion (Iraklion, Ηράκλειο) is the largest city of Crete . With almost 140,000 inhabitants, it is the fourth largest Greek city. Together with the neighboring towns, it forms an agglomeration of around 200,000 people. The important role played by Heraklion in Crete is underlined by the fact that the city is also the administrative capital of the island . Heraklion, Herakleion, Iraklion, Iraklio is the transliteration of the ancient name Ἡράκλειον that Idaean Herakles wore. Please, however, do not combine this Heracles with the mythical twelve works, because the namesake of Heraklion is an ancient Greek resident known for having initiated the tradition of crowning the heads of the Olympic winners with garlands of olive branches. Heraklion's second still-known term is Candia. This is the Venetian name of this city derived from the word Chandax (Χάνδαξ or Χάνδακας). Under this complex phrase is the Greek name of the moat. A curiosity and at the same time the proof of the multicultural character of Heraklion is that the term Χάνδακας derives from the Arabic word al-ḫandaq rabḍ. In this way, the name Candia combines the influence of the three most important cultures shaping the history of Crete. The last name under which Heraklion operates is Κάστρο (Kastro), meaning the castle in Greek. The inhabitants of this castle are called Καστρινοί. Some scientists suppose that although there is no direct evidence, the origins of this city can reach as far as 2000 BC. It is believed that in the Minoan era, in the area of ​​present Heraklion, there was a town that served as the sea port of Knossos. The official confirmed date for the founding of modern Heraklion is 824, when the Saracens came to Crete. During this period, Heraklion served as a nest of pirates splitting Byzantine warships flowing in the area. It was only the expedition that the Byzantines carried out in 961 that put an end to this activity of the city of Rabḍ al-ḫandaq ("The Castle of the Moat"), as it was then called Heraklion. It was this year that the army under the leadership of the future Byzantine emperor - Nicefor Phokas, landed in Crete. After a long siege, Heraklion collapsed, the city was plundered and burned, and most of the inhabitants were murdered. Despite the tragic end of the reign of Saracens in this city, Heraklion is quickly rebuilt and under its name Chandax begins its nearly 250-year history under the leadership of Byzantines. Year 1204 is another landmark date in the city's history. As a result of the 4th Crusade and the political games that were fought after it ended, Heraklion passed under the control of the Venetians. However, this is done in a rather unusual way, because the city changed its owner on the terms of purchase / sale (allegedly for a thousand pieces of silver). The Venetians are re-naming the city from the Byzantine Chandax to the Italian Candia. Under this name Heraklion operates several centuries, and with time the term Candia is also used in relation to the whole of Crete. During this period, the city is experiencing rapid development, the effects of which are still visible today. It is the huge walls surrounding the old part of the city (with a thickness of up to 40 meters), 7 bastions and the fortress in the port is the work of new owners. After 1212, the Venetians begin to settle in Candia. The mixing of two coexisting cultures leads to the flourishing of literature and art, whose influences radiate throughout the whole of Crete. The period of this dynamic development is now called the Cretan Renaissance. The year 1669 put an end to the reign of the Venetians in Heraklion. After the (longest) siege lasting 24 years, the Ottoman army captured the city. However, this success was paid by the Turks with high losses. Only in the last 22 months in the bloody battles killed more than 70 thousand. soldiers. The new rulers, like their predecessors, have renamed the city, which from 1669 was to be called Kandiye. Among the Greek inhabitants, however, the name "Megalo Kastro" (Μεγάλο Κάστρο), ie the Grand Castle, was more popular. Unfortunately, the Ottoman era is the time when Heraklion is in decline. As a consequence of neglect, the Venetian seaport is silted, and most of the ships sailing to Crete were calling to Chania , which at that time took over the role of the most important city of Crete (and the capital of this island). It was not until 1898 that as part of the autonomy of Crete, he regained some of his former independence. Until 1908, Crete was under the occupation of the great powers, and Candia was a part controlled by the British. During this period, the city changes its name again and is renamed today's current, or Heraklion. It was not until 1913 that Heraklion and the rest of Crete were incorporated into the Kingdom of Greece. Another date that has a strong impact on the current appearance of the city is 1941. As a result of German bombings conducted as part of the invasion of Crete, a large part of Heraklion is destroyed. Despite the reconstruction, the city never regains its original appearance. In 1971, the administrative center was moved to Heraklion, and thus the city takes over the title of the capital of Crete from Chania . Heraklion is located in the central part of the northern coast of Crete. The easiest and most convenient way to reach this city is by renting a car. Of course, there is nothing to prevent you from using the quite good bus communication that is served by KTEL. Due to its size and its administrative function, Heraklion is very well connected with the rest of Crete. Along the southern outskirts of Heraklion runs the Nowa Droga Narodowa, which is the best transport route connecting it with the other largest cities of the island, that is looking from the western end of the island with: Kissamos, Chania , Rethymnon , Malia , Agios Nikolaos and Sitia. Mostly this route does not require more skills from the driver, as it is a road that does not differ from the Polish national and express roads. Difficulties can be encountered while driving from the city of Sitia, where a large section of the E75 route runs along the former National Road. Also when driving through Malia, you have to take into account traffic jams that are created by cars passing through this place. The center of Heraklion, like in the case of other major cities of Crete, is a maze of narrow streets, where in most cases one-way traffic is in force. I strongly advise you not to drive your car into this thicket of streets. Even the best maps and GPS navigation will not be enough help in finding yourself in this maze, and problems with parking and dense traffic will only deepen your irritation. Hiking is definitely the best way to explore Heraklion. The car can be parked in the vicinity of the port (eg along Leoforos Nearchou street, where it is relatively easy to find a vacancy), or on one of the several paid car parks that are located on the outskirts of the old town. Elafonisi is a small island located at the end of the southwestern edge of Crete. A characteristic feature of Elafonisi is the shallow lagoon connecting it with Crete. This is the second largest airport (IATA code: CHQ) in Crete. In 2010, the airport in Chania served a total of over 1.65 million passengers. Chania (Χανιά) is the second largest (after Heraklion) city of Crete. The biggest advantage of Chania is the area of the Old Town and the beautiful Venetian Harbor. Aptera is a city whose history dates back to at least a thousand years before our era. In the peak period, about 20,000 lived in it. people, of which only 1/5 were free people. Chania (Χανιά) is the second largest (after Heraklion) city of Crete. The biggest advantage of Chania is the area of ​​the Old Town and the beautiful Venetian Harbor. The genesis of the name of this poviat will not surprise anybody who will break the road from the Imbros gorge to Hora Sfakion. Frangokastello is a small fortress that was built by the Venetians over four years from 1371. Initially, the castle was named after Saint Nikitas. (Χρυσοσκαλίτισσα) The Church of the Blessed Virgin Mary with the Golden Step from the 17th century is the westernmost church building of this type. Omalos is a perfect starting point for exploring the Samaria Gorge. Located over 1,100 m above sea level extends over an area of 25 km2. Its size corresponds more or less to the size of the Lasithi Plateau. The steel crossing, which in the central part is separated from the ground by nearly 150 m, is at the leading position of the places where the longest bungee jumps are made. Loutro is famous for the fact that you can get to it only from the sea or walk on the mountain trail, because there is no other road here. Stavros used to be a small fishing village. Today, it is primarily a tourist destination, but in a positive sense. The cave is less than 1 km from Moni Gouvernetou Monastery. You will reach it using the pedestrian trail that has been marked out along the slope of the Avlaki Gorge. Balos is one of Crete's flagship beaches if not all of Greece. We can assure you that the landscapes you see during your trip to Balos will remain with you for a very long time. Moni Katholiko is probably the oldest and most spectacular monastery in Crete. It is located 20 km north-east of Chania. The Orthodox monastery of Agia Triada, located on the northern part of the Akrotiri peninsula, is one of the most beautiful and richest monasteries in Crete. Gouverneto Monastery is probably the oldest active Greek Catholic monastery located on the Akrotiri peninsula near Chania. The length of the trail leading through this place is about 8 kilometers and the difference in altitude is about 600m. Until the early nineties, this place was known only to few tourists and local residents. Samaria is one of the most important tourist attractions located in the western part of Crete. Glyka Nera is one of the most spectacular beaches in Crete. Sougia is a small town located in the southwest of Crete. On the north-western coast of Crete, at the foot of the Gramovous peninsula, there are ruins of the ancient port of Korikos, later known as Falassarna. Milia is an authentic mountain settlement, which most probably dates from about the seventeenth century. Knossos is one of the flagship monuments visited by tourists, it is also the most popular place where organized trips go. 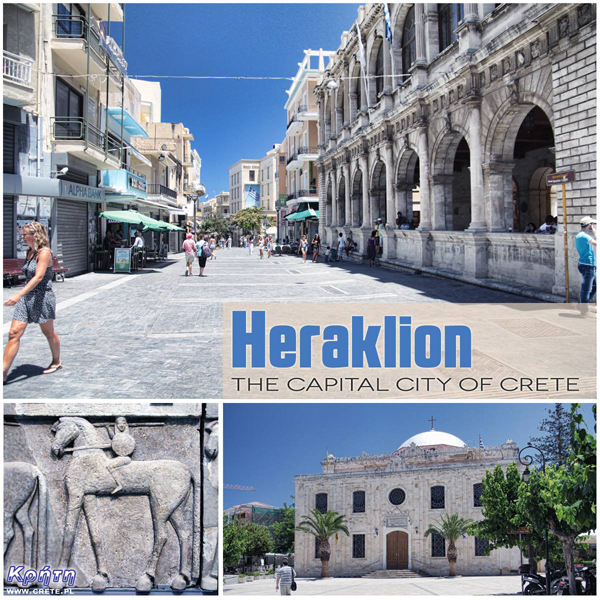 Heraklion (Iraklion) is the largest city of Crete. With almost 140,000 inhabitants, it is the fourth largest Greek city. Dozens of craft workshops located in this small mountain village make Margarites one of the four main centers where traditional Cretan ceramics are made. International airport. Nikos Kazantzakis in Heraklion is currently the largest airport in Crete. The date of the foundation of Moni Arkadiou (Arkadi) is not exactly known. According to tradition, the name of this church refers to the name of the Emperor Arkadiusz, who supposedly was to be its founder. Rethymnon with around 40,000 inhabitants are the third largest city of Crete. This place was populated already in the Minoan period. Historically, the city was an important commercial center. Thrapsano is a small town inhabited by slightly over 2,500 people, the vast majority of which until recently maintained their activity as a potter. According to Greek mythology, Zeus hid (and perhaps even gave birth) in the Ida cave. This myth is the greatest asset of this cave, which is not as interesting and beautiful as the Dikte cave. Tripiti is a small beach covered with a mixture of gray sand, gravel and stones. Despite the fact that the beach is unorganized and has a semi-natural appearance, one small tavern works here. Plakias is a perfect place for people who like to spend time hiking. In the area of the town and the surrounding area, there are several hiking trails that lead to interesting beaches. Currently, the lower monastery is still not open to the public and is not used by the monks. The buildings of the upper monastery have undergone partial renovation and are the main seat of the Preveli monastery. The Kourtaliotiko Gorge, also known as the Asomatos Gorge, is perhaps one of the most spectacular natural attractions available in the central part of Crete. Agia Triada is a small Minoan archaeological site in the south of Crete, located near Timpaki, located on the western slope of the hill about 40 meters above sea level. Currently, Melidoni Cave (originally called Gerontospilios) is associated mainly with the tragic events that took place here in 1824. This fortress is a perfect example of Crete's multiculturalism. Located today in Greek hands, it was built by the Venetians, but is called a name taken from the Turkish language. It is one of the most important and largest museums in Greece and one of the most important in Europe. Tylissos is one of the few places in Crete that has kept its name since ancient times. Agios Pavlos is a small town located on the southern coast of Crete near Saktouria. 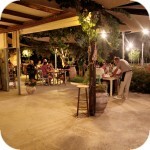 Triopetra is located at the foot of the Siderotas mountain about 52 km south of Rethymno. The observatory is located at the top of the Skinakas mountain at an altitude of 1750 m. The idea for its construction was born in 1984. The Late-Romanesque cemetery in Armeni is located on the outskirts of this town, located less than 10 km south of the center of Rethymno. The museum presents the dramatic history of Crete written over the last several hundred years. Lentas is a good idea for those who want to get away from villages steeped in industrial tourism. This ancient quarry, consisting of two parts by modern times, is called Λαβυρινθάκι and Λαβύρινθος. If anyone of you is looking for a good restaurant near Matala and Kalamaki, then we would like to recommend estiório Chrisopigi. Gortyna is considered one of the most extensive excavations in Greece. Psiloritis (Timios Stavros - Holy Cross) is the top of the highest mountain of Crete, rising to 2456 m above sea level. Rouvas Gorge is one of the most interesting places in this part of Crete. The interesting trail leads in a perfect way to the changing appearance of this gorge. Matala is one of the most popular towns not only of the southern coast but also of the whole of Crete. In the 1960s and 1970s, this small fishing village was a mecca for hippies. The Odigitrias Monastery is one of the most famous monasteries of southern Crete. Unfortunately, in terms of popularity, he is far from other Cretan monasteries. Kali Limenes (meaning Dobre Porty or Piękny Przystanie) is a coastal town located in the Asterousia Mountains on the southern coast of Crete. Information about one of the more known tourist cities of Crete, or about Malia. Description of attractions located in the city of Malia and a description of the specificity of this town. Kritsa is one of the largest villages in Crete. The village has a lot of shops with local crafts. The Lasithi Plateau is located about 70 kilometers from the capital of Crete - Heraklion. The average height at which the terrain of this plateau is located is 840 m above sea level. One of the tourist attractions eagerly visited by people spending their holidays in Crete is the Dikte (Psychro) cave. The main factors that attract people to this cave are a rich and varied dripstone robe and a close connection with mythology. Among the olive groves in the place called Logari, which is less than a kilometer from the village of Kritsa, there is a small Byzantine church of Panagia Kera from the 13th-14th centuries. Most people crossing the route between Agios Nikolaos and Ierapetra will definitely notice the large crack which is marked by the mountain located east of this road. This majestic geological creation called Ha was probably created as a result of an earthquake. Xerokambos is a small settlement in which you will find literally several taverns, and most of the buildings are single-storey and one-story houses. The big advantage of this beach is a gentle sandy descent to the sea. Agios Nikolaos (Άγιος Νικόλαος) is a small town with less than 20,000 inhabitants. permanent residents (according to statistical data from 2001). This city is the capital of the Lasithi nomos. Although Elounda seems to be a sleepy fishing town to this day, however, appearances should not fool you, because this town and its surroundings can boast of probably the largest number of the best hotels. The ancient city of the LATO can be found near the charming village of Krista near Agios Nikolaos. It is recognized that Gournia was inhabited between 3000 BC. 1,200 BC and is one of the few cities unearthed to a large extent. Zakros is the fourth-largest Minoan palace in Crete in importance and size. This latest found, built on the east coast of the island is located in the village of Káto Zákros. The first palace was built around 1900 BC. in the place where there was a quite impressive settlement whose remains were later transformed into the central part of the city. Moni Toplou (Μονή Τοπλού) also called as The Great Monastery is one of the most beautiful and important monasteries in Crete. Mochlos is a small town located roughly halfway between Agios Nikolaos and Sitia. This inconspicuous little island located about 5 km from the center of Elounda is one of the biggest tourist attractions in Crete. When heavy equipment entered the promontory near Sitia, no one expected that this area contained the ruins of the Hellenic city. The abundance of water and shade mean that even at the peak of the tourist season, this place is full of lush vegetation. At the top of a cone-shaped hill called Souvloto Mouri, the remains of an unusual building with a unique oval shape were discovered. The ruins of the ancient city of Itanos are located at the eastern tip of Crete, less than 3 kilometers north of the famous palm beach of Vai. Although there are also nice beaches at Itanos, unlike its well-known neighbor, this place does not attract crowds. There are either accidental stray tourists or excavation enthusiasts here. Ierapetra (Ιεράπετρα) is the fourth largest city of Crete and also the largest town located in the Lassithi prefecture. Diaskari Beach, also known as Green Beach, is less than 3 km from Makry Gialos. Koufonissi is a small island in the Libyan Sea, located just a stone's throw from the southern coast of Crete. Makry Gialos is one of the less-appreciated tourist destinations in Crete. Less than 10,000 population of Sitia makes the city the smallest in Crete. Some even go a step further and say perversely that it is rather the largest village of Crete. Napoleon's house is one of the few typically tourist attractions in Ierapetra. About what could have happened here in the summer of 1798 and possibly how much in this legend is the truth we write in the article on the page below. Zakros is a small town on the east coast of Crete, less than 40 km south-east of Sitia. Ierapetra (Ιεράπετρα) is the fourth largest city of Crete and also the largest town located in the Lassithi prefecture. It is located on the south-eastern coast of the island, in the place of its characteristic narrowing. The name of the largest city in this part of Crete is by no means synonymous with some astronomical number of people living permanently in Ierapetra. In 2011, it was only about 16 thousand inhabitants. Agios Nikolaos (Άγιος Νικόλαος) is a small town with less than 20,000 inhabitants. permanent residents (according to statistical data from 2001). This city is the capital of the Lasithi nomos. It is located in the central-eastern part of Crete, about 65 kilometers east of Heraklion. It is one of the first tourist resorts in Crete. Already in 1965, much earlier than in other cities of this island, the first hotel was opened here. Currently, Agios Nikolaos does not play such an important role in servicing tourist traffic in Crete, as it did years ago. Despite the fact that the city must now compete with other towns located in this area of ​​Crete (such as Plaka, Elounda, Istro, Kalo Chori), every year thousands of tourists rest here from all corners of Europe. gość PiotrWie: Było zimno - nasz gospodarz stwierdził że jeszcze nie serwował śniadania w kurtce. Ale od dziś się zdecydowanie ociepla i w przyszłym tygodniu ma być już ciepło. Joanna Wypych: Początek maja nigdy nie jest pewny jesli chodzi o Samarie. Jesli byly prognozy przelotnych opadow w regionie Chania, dosyc czesto zdarzalo sie zamykanie wawazu na dzien czy dwa. Jak wiadomo ta zima byla koszmarna i stan wody jest jeszcze wysoki. gość gośc XXXX: Dzień dobry, wybieramy się w tym roku w okresie Majówki na Kretę. Zastanawiam sie jak wygląda sytuacja pogodowa obecnie i czy ktoś może przybliżyć jaki rodzaj ubrań powinniśmy sie zaopatrzyć czy bardziej plażowe czy niestety raczej ciepłe swetry i kurtki? Z góry dziękuje za odpowiedz. Emilia Ignatowicz-Steć: Jak z pogoda w Stalidzie?